We have compiled a list of frequently asked questions to help you during a boil water advisory. If there’s anything else you want to add, post a comment below and we will update this article. 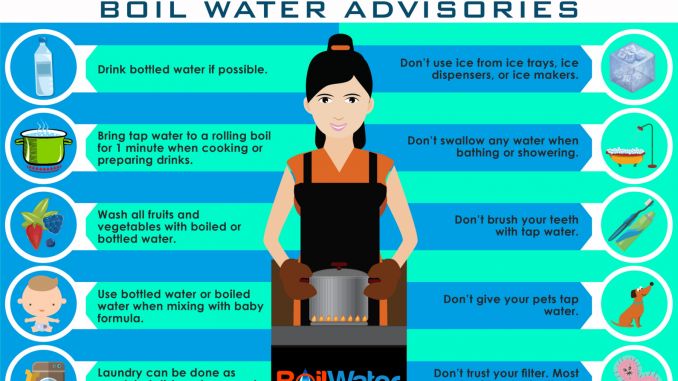 Why Is It Important to Boil Water During a Boil Water Advisory? Boiling water is cheaper than buying bottled water in the case that there is a boil water advisory in your area. Boiling water helps kill bacteria, microorganisms and contaminants present in the water. Boiling water only applies when an advisory is issued. This is needed for health and safety reasons. Many countries around the world have safe drinking water supplies and no longer need to boil water regularly. Is Bottled Water Necessary During A Boil Water Advisory? Bottled water is routinely inspected and typically meets health standards. It is a good alternative and the best source of drinking water during boil water advisories especially for the elderly, pregnant woman, babies drinking formula milk and people with health issues. How Can I Disinfect Water to Make It Safe for Drinking? While a boil water advisory is in effect the best method and the only way to make tap water safe again for drinking is boiling. Boiling water is an effective means of purifying it. Bring water to a rolling boil for 1 minute to kill harmful bacteria before drinking or using it. If you are living in areas without power or have an inability to boil your water for whatever reason, you can add ¼ teaspoon of unscented household bleach per gallon of water to disinfect your water. Is It Safe to Wash My Hands During a Boil Water Advisory? Hand washing using tap water under a boil water advisory is completely safe. Wash hands vigorously with soap and water and rinse well. If you are going to prepare food, use boiled water (cooled) or bottled water to wash your hands. Can I Take a Shower Using Tap Water? You can use tap water for bathing, showering, shaving and hand washing, just don’t let water get in your eyes, nose or mouth. Children, disabled individuals and persons with health issues may need to be assisted to make sure they don’t ingest water, as well as to put a limit on their bathing time. Using bottled water to wash open wounds and surgical wounds is advised until the boil water advisory is lifted. Can I Use Tap Water to Clean or Wash My Coffee Maker, Ice Containers and Soda Containers? No. Consider tap water ‘not safe to use’ until the boil water advisory has been lifted. None of these should be used when they are connected to your water supply. Only boiled water and bottled water must be used for making coffee or ice. It is also advisable that these devices are flushed, cleaned and disinfected as stated on the manual once the boil water advisory is lifted. How About for Brushing Teeth? Only boiled water and bottled water should be used when brushing your teeth. Can Tap Water Contaminate Dishes When Washed? Yes it can. Hand washed dishes must be rinsed thoroughly using boiled water or water with ¼ teaspoon of unscented bleach per gallon of water. Dishes must be air dried completely. Household dishwashers don’t reach the proper temperature in order to sanitize dishes. How About Using Tap Water for Washing Clothes? It is safe to use tap water to wash clothes. How Do I Properly Wash Fruits and Vegetables Before Eating Them? Cooled boiled water is needed when washing fruits and vegetables, although bottled water and water with unscented household bleach can also be used. Throw away uncooked food, ice cubes and beverages made on the day the boil water advisory was issued. Can I Use Tap Water for My Household Pets? Care for your pets the way you care for yourself. Proper precautionary measures must be taken when giving your pets water. Give them boiled or bottled water only. What Should I do if I Have an Infant? Breastfeeding mothers should continue feeding their infant and if infant is bottle fed, it is important to wash and sterilize bottles and to feed them boiled or bottled water while the boil water advisory is in effect. What Happens if I Consumed Potentially Contaminated Water? Although the likelihood of becoming ill is low, it is best to keep an eye on your health with these symptoms and go to the nearest doctor or hospital right away when symptoms are present. What Types of Harmful Bacteria are Present in Contaminated Water? Organisms such as E.coli, Shigella, Giardia, Cryptosporidium and other viruses may be present in tap water. Although they are not life threatening, people with compromised immune systems, older people and young children may be at risk of health threatening issues when contaminated water is ingested. How Long Does a Boil Water Advisory Last? Boil water advisories are unique and it is not always predictable how long they will last. Water sample testing being done while the advisory is in effect and boil water advisories can only lifted by authorities once these tests are complete. While a boil water advisory is still in effect, consider tap water bad for your health and always use proper steps to protect yourself and your household.